Learn the secret of pro bloggers and YouTubers. Welcome to the world of affiliate marketing- a popular technique used by the smartest bloggers to earn huge amounts of money from their blogs. All of them started like you- with a few dollars and a desire to learn. Once they understood the true way to earn big in any niche, they never looked to AdSense or any other monetization programs ever again. 'The Handbook to Affiliate Marketing' is the most practical affiliate marketing eBooks online. This eBook has sold more than 1,000 copies on platforms like Instamojo and Gumroad (to name a few). 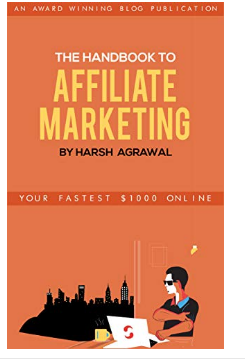 This affiliate marketing eBook is your roadmap to creating a successful empire. Written after 9 years of affiliate marketing experience, and including things that have helped me earn over $80,000 in the last couple of years, you will surely benefit from the wisdom inside. -You want to make a living out of online income. -You are serious about learning and earning huge money. -You understand and value the internet life.